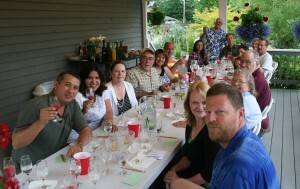 The June Taste to Learn event was Tequila and Margaritas on Saturday, June 16th, at Darlene and JR’s home, the main dish was chicken enchaladas. Each couple brought their favorite Margarita for all to taste and score. There also was a tequila tasting experience for $5 charge. We learned about, tasted and compared 4 types of tequila: 1. Blanco (white or silver), 2. Reposado (aged minimum 2 months but less than 1 year), 3. Joven (young or gold) which is a mixture of Blanco & Joven, 4. Anejo (aged minimum of 1 year but less than 3 years in oak barrels).